This blog saw me pick up an ukulele for the first time, create a group to start playing with friends, and mess around in a million different ways trying to make instruments and cases and crazy headstock hats for ukes. The group is still humming (strumming?) along, and some of us have even started music lessons. There is a whole genre of literature on taking up a musical instrument later in life, all of which I'd like to read some day. Meanwhile, it is clear to me just from a casual survey of friends that there is a special pleasure in learning music after years of raising children a/o focusing on work. It could turn into a real problem. This summer my teacher casually mentioned that I might enjoy playing tenor guitar. I didn't know what a tenor guitar was; Bob explained that it was a transition instrument originally made for tenor banjo players in the 1920s and '30s, and tuned CGDA like the tenor banjo. It had multiple tuning options, though, one of which was DGBE, like a baritone ukulele. 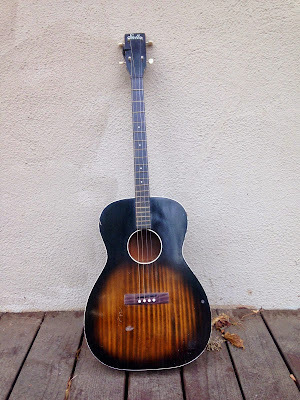 Last week an old tenor guitar popped up on craigslist. You know what happened next. It's a 1950's Stella, sold in catalogs at the time for around $23, less than a quarter of what I paid for it 60 years and several scratches and dings later. The neck has been reset, and the tuners have been replaced; but it still plays fine as far as I can tell. Elvis played a Stella tenor in the movie Frankie and Johnnie (1966). It's a brief segment of this clip from about 0:10 to 0:20. The only catch for me is that age is also inspiring me to pare down; and a guitar, even a little one, hardly fits into the downsizing spirit. 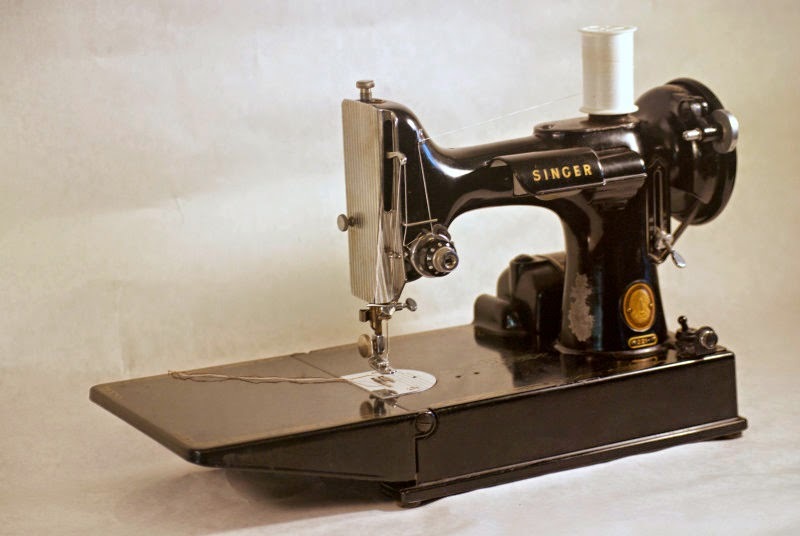 So I went to the same craigslist and sold the Singer Featherweight. There were good memories tied to this machine. My older son named her Betty and learned to sew (and to oil and adjust machines) on her. He made quilts, pajama bottoms, and Halloween costumes over the years; but his interests have changed, as well, and I prefer sewing on the 201 and 301. So the Singer is gone, and the guitar is here, and that seems to sum up for me how what we value changes over time. Or there's this: the night before S was born 16 years ago, I stayed up late talking with my childhood friend Rel. A few hours later, my water broke and I called another friend, Carey, who came to be with 5yo C during the home birth. As it happens, I saw both of these friends in the last week. Rel now plays fiddle and mandolin. Carey and I play ukulele together. Responses from cool people—please be sure to visit their blogs as well!